Rice noodles sautéed with shrimp, chicken, egg, baked tofu, green onions and fresh bean sprouts. Rice noodles, Chinese broccoli, egg and choice of meat sauteed with special sauce. Beef, pork or chicken sauteed with egg noodles and assorted fresh vegetables. A combination of chicken, beef and shrimp sauteed with onions, egg, tomatoes, peas and carrots. Choice of beef, chicken or pork sauteed with onions, egg, tomatoes and peas and carrots. The food is always good. The driver was very nice and helpful even though I wasn't. He drop off the food on the doorstep of the neighbor's house because I didn't answer the phone. I called him upset that he dropped it at the wrong address and just leaving without confirming. He precedes to tell me the address he has and calmly tells me to check the address on my app. I wasn't having it but turns out he was right. I appreciated his calm demeanor with the situation and I am absolutely sorry. It was my first time trying Narai Thai and I was definitely happy I choose them for my first Grubhub order ever! The pad see eww noodles and coconut soup spicy were delicious ! And don't forget a little dessert; the Thai tea and a few fried bananas to end the meal !!! I give them 10/10. I am often afraid to try new food but I am happy I gave them a shot. I will be ordering from Narai Thai again. My order was delivered to the wrong home, I typed in the wrong address by one digit, and after waiting more than an hour I called the restaurant, it was determined that food was delivered to the wrong person but Narai Thai manager was professional and polite and made my order and delivered it to the correct address. The lemongrass soup was the best! Im not sure why they offer beef in the restaurant but not for delivery. The crispy wontons are delicious and a great accompaniment to the soup. I cant wait to order again! Food was earlier than expected, correct, most importantly delicious. I dine at this restaurant regularly and the food and service is always amazing!!! Great taste, I'm definitely ordering from them again I'll just factor in more time because they might be really busy. Great food! The chicken and broccoli was great. Quick delivery. Will order agian!!!! Welcome to Narai Thai. We are proud to serve authentic Thai cuisine in Downey. We use only the freshest ingredients to create healthy and tasteful Thai dishes, including curries, noodle dishes, seafood specialties and vegetarian options. 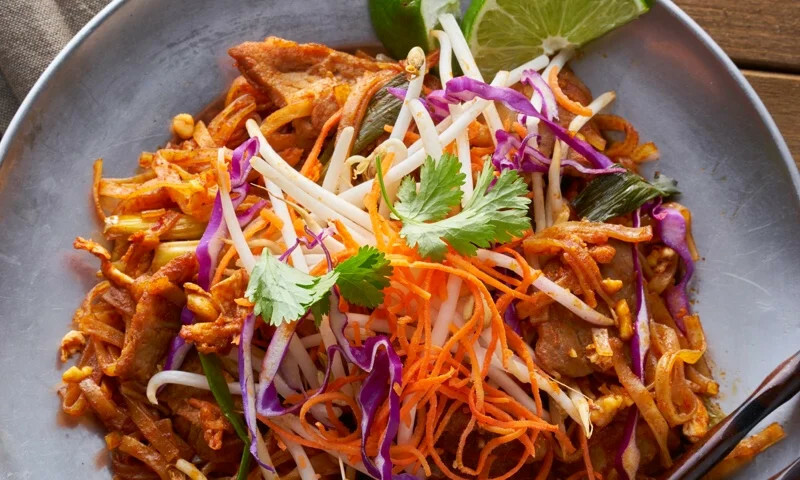 Whether you're craving a quick bite or looking to treat yourself to a delicious meal, you can now order your Narai Thai Cuisine favorites for takeout or delivery.